If it is one topic that is discussed the most, inside and outside the organizations today, then it has to be on cloud visibility. Organizations, irrespective of their size, want to know more on this topic and what each enterprise lacks today is the visibility into what is happening on their networks. No doubt, all the organizations have migrated to cloud and have adopted cloud computing methods for workflow as well as data storage, but this transition has only added to the lack of network visibility and it is not just for Software-as-a-Service (SaaS) applications. The issues faced with regard to the deployment of cloud services are the unauthorized use of cloud applications to the cluttered permissions on it. This problem lies in the lack of visibility on the networks, which is by and large solved by the Cloud Access Security Brokers (CASBs). It is true that most of the SaaS apps have limited visibility and control options and to counteract it, CASBs provide critical control points to secure the use of cloud services. CASBs are effective even across multiple cloud providers. Data security, cloud service visibility, compliance and threat protection are the benefits offered by CASB for crucial data security of enterprises. CASBs sit between the cloud consumers and cloud service providers and act as security policy enforcement points. If any organization is using cloud-based apps and still hasn’t deployed CASB solutions across its network, then it stands the risk of being attacked by varied security threat vectors. CASBs inspect the apps and data of the enterprise moving on the cloud and quarantine the critical data stored in the cloud. It thus minimizes the impact of data leakages when it finds suspected malware propagating on the cloud. CASBs also enable enterprises to comply with international regulatory standards by governing the cloud-based apps. CASBs also provide continued visibility into the employee use of cloud apps. So, CASB solutions definitely act as the centerpieces of enterprise cloud security deployments. CASBs, in addition to providing continuous visibility into sanctioned and unsanctioned cloud-based apps, also target a broad array of varied complex use cases. CASBs are advantageous in that they provide gainful insights into the ways a user accesses the cloud services. They tell us about the users, the devices used, the apps accessed and the ways in which it is used. Most importantly, CASBs provide cloud visibility and security across cloud SaaS environments. CASBs help enterprises to be more productive, agile, and economical; and also help them meet their growth objectives. The shift to cloud-based apps and SaaS has helped enterprises in many ways, but the gap in security and compliance cannot be filled by any traditional approach. There are various aspects to be covered in a security module like the visibility of data sharing, suspicious activity, unauthorized access through geographical boundaries and IP addresses. The security gap that has to be addressed has to include all of these and help enterprises achieve compliance and help in threat prevention and protection just as in case of traditional on-premises security apps. The foremost step for an enterprise would be to identify the areas of risk and segregate the crucial data so that security can be applied effectively. CASBs help in providing varying degrees of policy enforcement. It can be customized to provide coarse-grained enforcement at the application-level to a more strict control at the activity-level. 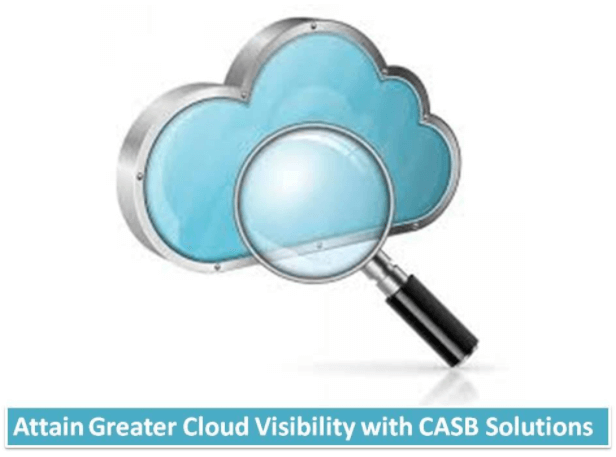 CASB solutions work on four pillars of cloud visibility, data security, compliance and threat prevention. There are various commercial and legal reasons why enterprises need to protect their corporate data. CASBs help enterprises to fill in the gaps when they move from on-premises based apps to cloud-based apps like Microsoft Office 365 Suite, Google Apps/ G Suite, Zoho etc. In the booming CASB market, there are a number of CASB players offering cloud security and visibility, you can compare CASB vendors here.